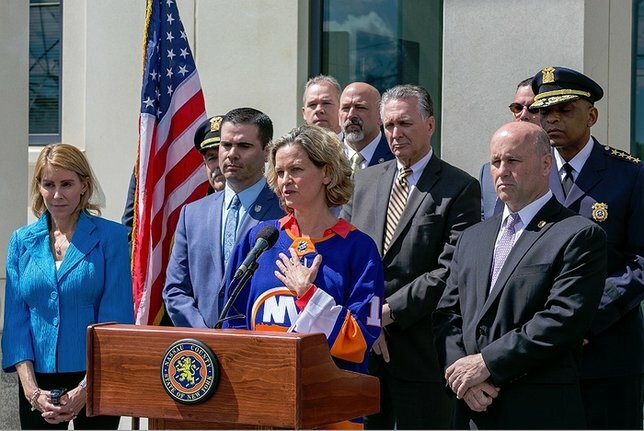 April 15, 2019 - Nassau County Executive Laura Curran today announced the reopening of Nassau County’s 8th Police Precinct with a ribbon-cutting ceremony, seven years after the precinct’s closure during the previous administration. The reopening of the precinct adds staff and services to enhance the county’s successful community policing initiative, which focuses on pro-active crime prevention and quality-of-life strategies. Earlier this week the 6th Precinct in Manhasset was reopened and restored to full-service after a similar seven-year shutdown. Commissioner of Police Patrick Ryder announced the appointment of Inspector Thomas Corona to serve as Commanding Officer of the 8th Precinct. “I am pleased to announce that in the past week, the Nassau County Police Department has been able to reopen both of our closed precincts with the full support of County Executive Curran,’’ he said. County Legislature Minority Caucus Kevan Abrahams said, “Local precincts are a valuable resource and a source of community pride, and reopening the Sixth and Eighth Precincts marks the end of a misguided consolidation plan. I thank my colleagues in the Legislature and County Executive Curran for their commitment to community policing across the County." The precinct at 299 Hicksville Road serves Bethpage, Levittown, Plainview, and Farmingdale. The building was recognized for outstanding design in January by the national the Precast Concrete Institute, one of only three projects in the county to receive the Institute’s highest honor. Despite the outstanding design, the building was never utilized to its full potential as an operating precinct, a fixture in the life of the community. The widely praised problem-oriented policing deployment, or POP, is among the initiatives returning to the restored Eighth Precinct command. This proven program assigns officers to work closely with community leaders, business owners, and residents – particularly young people. Officers focus on crime prevention, safety issues, traffic hazards, graffiti complaints, among many other quality-of-life issues. “As I have said before, community policing is part of Nassau’s DNA,’’ the county executive said. “We do it better here than anywhere else---thanks to hard work, dedication, and commitment of the men and women of our police department.” Under Ryder's leadership, Nassau “is one of the safest counties of its size in the nation," she said. Curran thanked the members of the county legislature for their bipartisan efforts in support of reopening both precincts. Subject: LongIsland.com - Your Name sent you Article details of "Nassau Executive Curran Announces Reopening of Eighth Police Precinct"